Eli Manning throws during the Giants’ win on Sunday at MetLife Stadium. EAST RUTHERFORD, NJ — Two straight wins doesn't mean a total turnaround, but one thing that is assured is that the New York Giants will feel much better about themselves when they visit the Eagles at Lincoln Financial Field on Sunday than the last time the teams met. The Giants (3-7) won their second in a row during Sunday's 38-35 victory over the Tampa Bay Buccaneers at MetLife Stadium. Never mind that the two wins in this "streak" were against San Francisco and the Bucs, two teams with a combined 5-15 record. Or that the Giants let the Bucs hang around despite the fact that Eli Manning had one incomplete pass, which actually could have gone for a touchdown. The Giants also had four interceptions and one fourth-down stop and still Tampa Bay got to within 38-35 on a Mike Evans 41-yard touchdown catch from Jameis Winston with 2 minutes and 22 seconds left. Winston would end matters for good when he threw a first-down interception with 13 seconds left. Afterward, the Giants were questioned about whether they can get back into contention in the NFC East, where nobody appears capable of running away with things. It's hard to know what was more surprising, that the Giants were asked this question or that they actually felt there is still hope. "We've got a long way to go and there are a lot of things we have to get better at, but if we can keep battling and fighting, who knows? Giants coach Pat Shurmur said. Shurmur, who spent two stints as an assistant in Philadelphia, wasn't expressing even slight optimism after the Giants lost, 34-13 at home to the Eagles on a Thursday night game that dropped their record to 1-5. New York would eventually fall to 1-7 before this current modest two-game winning streak. "I think there is some excitement going around," said Manning, who completed 17 of 18 passes for 231 yards, two touchdowns, no interceptions and a 155.8 passer rating. "It's a good feeling to have in the locker room and you see some growth." The biggest growth continues to come from running back Saquon Barkley, who has lived up to his billing after being the No 2 overall pick the draft from Penn State. Barkley rushed for a career-high 142 yards and two touchdowns on 27 carries and also caught a 6-yard touchdown pass from Manning to open the scoring. It was his best game since gaining 130 yards and a touchdown on 13 carries and catching nine passes for 99 yards in the loss to the Eagles on Oct. 11. Barkley did show his human side by dropping Manning's only incompletion after getting wide open, but turned around near the end zone on a wheel route. "I definitely owe Eli something because he would have had a perfect day and I have caught that ball multiple times in practice," Barkley said. Of course, Manning and the rest of his teammates wouldn't have had a winning day without Barkley. "We're executing, we're finishing games, and finishing drives," Barkley said. 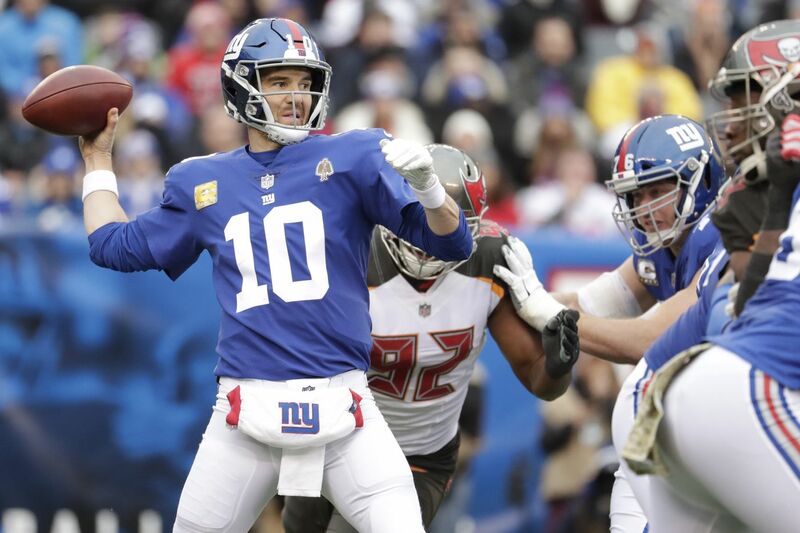 Still, the Giants were fortunate that Bucs starting quarterback Ryan Fitzpatrick didn't duplicate his effort from an earlier 27-21 win over the Eagles when he threw for 401 yards and four touchdowns. Against the Giants, Fitzpatrick was yanked after throwing his third interception with 9:42 left in the third quarter. His passer rating was 47.2, compared to 144.4 against the Eagles. Despite all the turnovers, which included one pick-six by Giants linebacker Alec Ogletree, the defense had trouble containing Tampa Bay, which if anybody is counting, scored one more point against them than the Eagles. Still, nothing dampened the Giants' mood on this day. After falling to 1-7, receiver Odell Beckham predicted the Giants would run the table. He is 25 percent on his way toward making that prediction come true. "The goal is to win every game," said Beckham, who had four receptions for 74 yards and a touchdown. "So, six games left, it's really only crazy until you do it." Crazy to think about it, and crazier to realize nobody on the Giants, at this point, is dismissing it.